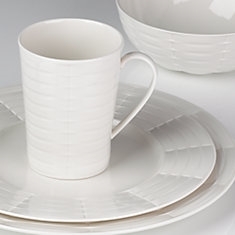 The Entertain 365 Sculpture Woven 4-piece Place Setting is perfect for any occasion. This set of dinnerware is sculpted in a subtle weave pattern and includes dinner plate, salad plate, all purpose bowl, and mug. Diameter of dinner plate: 11", salad plate: 9"
Capacity of all purpose bowl: 16 oz., mug: 12 oz.